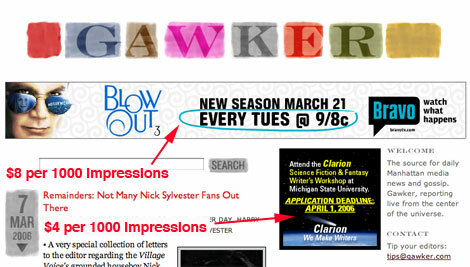 I only just noticed that Gawker Media finally has a website. tuning out ads which aren’t in the direct line of copy. but even gets more traffic than Fleshbot. but we can assume it’s negligible. except for text ads sold by Adbrite. out by taking Gawker Media public. Imagine: the first blog IPO. They don’t list Fleshbot on the site under titles. Too naughty? That used to be the case, Morty, but it’s there now.